Get ready to dig through your old boxes of long-forgotten cards and dust off those Doom Blades and Elvish Mystics, because it's time for a Pauper tournament! Bring your best deck composed of only cards that have been printed at common rarity and compete in a swiss tournament capped at three rounds for booster packs! $5 covers your tournament entry, and you'll win a standard booster pack of your choice for each match win, with an additional pack going to undefeated players, so play it out til the end! 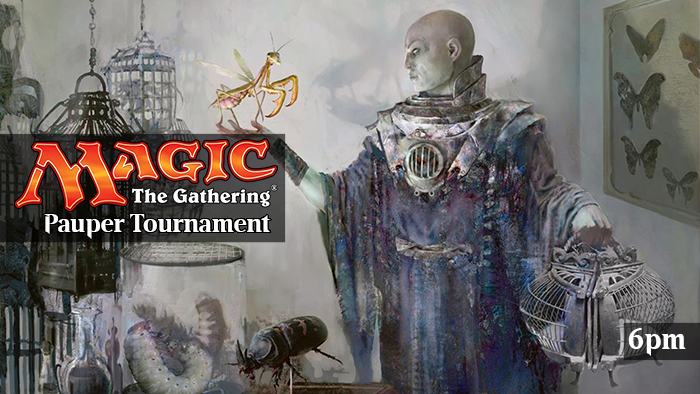 This tournament will follow the rules and banlist for the MTGO Pauper format, linked below. Please note that some cards such as Sinkhole have not been printed at common in a Magic Online set, and so are not legal in this format despite having been printed at common in paper sets.